Born in Scotland in 1895, Anne Redpath is considered by many to be one of the most important Scottish artists of her time. Following in the footsteps of the Scottish Colourists, William Hardie once wrote ‘by temperament a great lover of life with a wide circle of devoted friends, Redpath was perfectly equipped to play a major role in the development of the Scottish Colourist tradition.’ Also inspired by the work of Matisse, Redpath’s paintings display a vivacious use of colour and form and a dramatic, expressive handling of paint. Redpath attended Edinburgh College of Art from 1913–1919, travelling throughout Europe before marrying the architect James Beattie Michie and settling in France to raise a family in 1920. On her return to Scotland in 1934 she moved to Hawick and began to paint once more. Her first one-woman show was held at Gordon Small’s Gallery in Edinburgh in 1947 and from then on her work matured from almost monochromatic still lifes and landscapes in greys and white to a more vibrant palette displaying an avid attention to colour, balance and form. 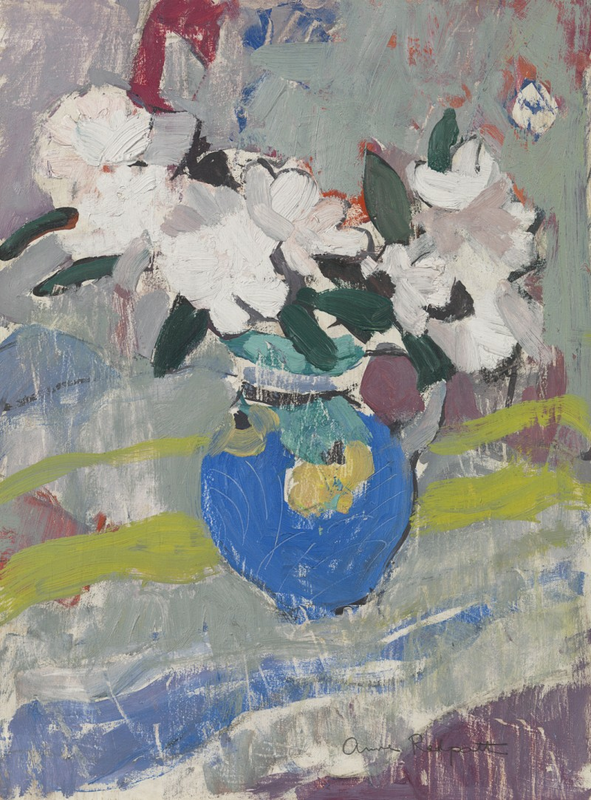 Anne Redpath was a great admirer of the works of the Scottish Colourists, Samuel John Peploe and Francis Campbell Boileau Cadell and, under their influence, painted cool, harmonious still lifes. While talking about her paintings in 1961 Anne Redpath said: ‘I think really I am an artist that likes contrasts, both in my life, the things I live amongst, and therefore while I am someone who is very interested in colour, and by that I mean bright colour, gay colour. But at the same time, if you are a colourist, you like quiet colour as well, and I think this love of gay colour contrasted in my mind with this love of whites, and greys, and as far back as I can remember I have loved painting white…’ (Patrick Bourne, Anne Redpath, p. 87). Born in Scotland in 1895 Anne Redpath is considered by many to be one of the most important Scottish artists of her time. Following in the footsteps of the Scottish Colourists William Hardie once wrote “by temperament a great lover of life with a wide circle of devoted friends, Redpath was perfectly equipped to play a major role in the development of the Scottish Colourist tradition.” Also inspired by the work of Matisse Redpath’s paintings display a vivacious use of colour and form and a dramatic, expressive handling of paint. The daughter of a textile designer Anne Redpath attended the Edinburgh College of Art from 1913-1919, qualifying as an art teacher in 1917 and travelling extensively throughout Europe before marrying the architect James Beattie Michie and settling in France in 1920. On her return to Scotland in 1934 she moved to Hawick and began to paint once more. Her first one-man show was held at Gordon Small’s Gallery in Edinburgh in 1947 and from then on her work matured from almost monochromatic still lifes and landscapes in greys and white to a more vibrant palette displaying an avid attention to colour, balance and form. Elected a member of the Royal Scottish Academy in 1951, her first show was held in London the following year at the Lefevre Gallery and throughout her career she continued to promote the work of Scottish Artists. After her death a major retrospective of Redpath’s work was held at the Scottish National Gallery of Modern Art from 1966-67 and her work can be found in Museums throughout the world, including the Royal Academy, Tate Britain, The National Gallery of Scotland and the Art Gallery of New South Wales, Sydney, Australia. The artist cited in Patrick Bourne, Redpath 1895–1965. Her Life and Work, Canongate Books, Edinburgh, 1989, p.87. Cited in Patrick Bourne, ibid., p.39. Cited in Patrick Bourne, ibid., p.65.